The Cislunar Explorers, of Cornell University in New York, have engineered a tiny cubesat powered by water that could someday navigate around the moon. Here, it has separated into two satellites after deploying. A cereal box-size satellite, fueled by water power, is in the running for the first tiny satellite to orbit the moon. A Cornell University student team called the Cislunar Explorers is developing the little orbiter as part of NASA's Cube Quest Challenge, which is offering $5.5 million in total to teams that build small satellites known as cubesats. The Cislunar Explorers are in phase 3 out of the four-phase Ground Tournament portion of the challenge, and finished first in last spring's phase 2 tournament. If they make the top three teams overall, their satellite will get a ride on NASA's Space Launch System in 2018 to test out the water-powered technology it will use to navigate into orbit around the moon. "This has a very important goal, and that is to demonstrate that you can use water as a propellant," Mason Peck, a mechanical and aerospace engineer at Cornell and leader of the team of graduate and undergraduate students, said in a statement. "Of course, we'd like to be the first CubeSat to orbit the moon," he added, "but even if we don't, if we can successfully demonstrate that water is all you need to travel in space, we've gone a long way toward achieving some important goals." A spacecraft powered by water would no longer rely on Earth's resources to function, researchers said in the statement. Such a spacecraft could refuel at space-bound water sources, like asteroids, instead of bringing all the needed fuel along with it from Earth. "A lot of the mass we send into orbit these days is in the form of rockets — the only way we get anything into space," Peck said. "But what if we could use what's already there? If we could do that, if we could refuel spacecraft while they're already in space, that means that we could go farther, probably faster, probably accomplish a lot more, and we wouldn't rely on Earth for supplies." 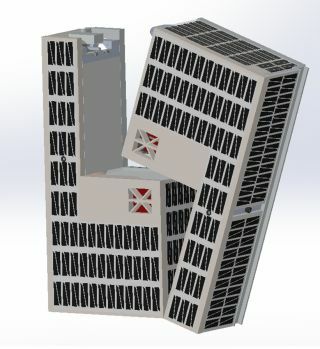 The tournament cubesat itself consists of two L-shaped pieces that would split apart, and each piece would head for the moon's atmosphere. They will both spin to maintain stability and will use electricity to separate the water into hydrogen and oxygen to use as fuel. Those fuels would eventually propel the two halves into the moon's orbit, where they will photograph the sun, moon and Earth to keep track of their locations — a technology called optical navigation. Both technologies, tested out in simplified form, could be incredibly helpful for future navigation and travel in space.